HOUSTON (AP) — On the day J.J. Watt was selected AFC defensive player of the week, the defensive end who missed most of the last two seasons with serious injuries was asked if he’s all the way back. 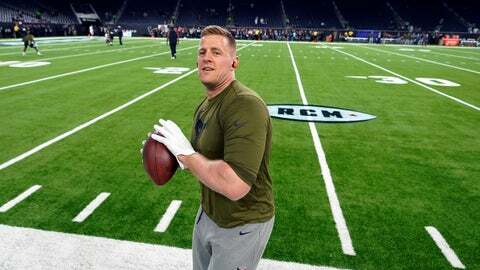 As well as Watt is playing in his comeback, he still believes he can do much more for the Houston Texans, starting with helping them extend their winning streak to nine games with a victory Sunday over Cleveland. Watt has been great in his return this season after not only sitting out the last 11 games of 2017 after breaking his leg, but also missing all but three games in 2016 because of a back problem which required two surgeries. He is tied for second in the NFL with 11 1/2 sacks, has 19 quarterback hits, 13 tackles for losses, has swatted down two passes, and is tied for first in the NFL with a career-high five forced fumbles. Then O’Brien was asked to weigh in on whether Watt is back to his old self after fighting through two years of injuries. Watt won AFC defensive player of the month honors for September, but this is the first time he’s won player of the week recognition since Week 17 of the 2015 season. He’s now tied with Julius Peppers for most defensive player of the week awards among active players with seven. He appreciates the recognition, but the three-time AP Defensive Player of the Year doesn’t think it means more because it comes in a season when he’s returning from injuries. Watt’s work this season has helped the Texans become the first team in NFL history to win eight consecutive games after starting a season 0-3. After missing so much time over the last two years, Watt has relished being on the field with his teammates and being part of the turnaround. And while he gets a lot of credit for how Houston’s defense is playing, he’s quick to point out the key to the team’s recent success has been that many players have contributed.